Scott Easterlow, left, is hoping Racing Club can build on the success of his first year in charge. In his first summer in charge of Racing Club Warwick, Scott Easterlow made the most of his call plan as he feverishly worked his way through a host of potential new signings. Faced with the difficult task of convincing players that ambitious plans for the club, both on and off the field , were going to materialise, Easterlow had to be at his persuasive best to assemble a squad good enough to compete at the top end of Midland League Division One. Ben Mackey has returned to the club. However, despite all the hours spent on the phone and sorting the wheat from the chaff courtesy of dozens of email enquiries, the former Stockton boss admits this summer has proved an altogether tougher assignment. “This summer I had the nucleus of my squad already here so you could say it’s been an easier pre-season for me but it’s been quite the opposite really,” he said. “I felt confident last year I could improve the side I inherited with ease with just two or three lads I definitely knew I could bring in. “We now have what I believe to be an already strong squad so to improve us again we needed to sign lads of a certain quality which is always difficult. Sean Castleton is one of Racers' summer acquisitions. “With all that in mind I wanted to have more of a structured recruitment process and it’s worked in terms of the personnel - those cold Tuesday nights in the rain watching games has paid off I hope. Having put his faith in the best of the local Saturday and Sunday league talent in his first full year in charge, Easterlow has now spread his net wider as he gets ready to tackle his difficult second season. Scott Turner has signed from Highgate, with Sam Beasley joining Sean Castleton in making the move from Rugby Town and Gerard McGahey linking up with Racers after leaving Rugby Borough. Former Studley stopper Ryan Young and ex-Coventry City youngster Ronee Hendricks have also made the switch, with the return of former Brake Ben Mackey giving an already talented squad much more depth. “It’s early days and you don’t get points for friendlies but we have turned in some good performances over pre-season and I’m very happy with the squad we have assembled,” said Easterlow. “I hope it’s a start of something exciting for everyone at the club. “I’m sure the fans will appreciate the new lads just as much as they do the familiar faces. A lack of squad depth proved telling in the closing stages of last season as Racing Club battled a brutal fixture pile-up. 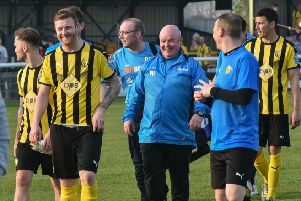 A cup final appearance and their highest league placing since 1989 would, on the face of it, seem like a decent return for a manager’s debut campaign in the Non-League Pyramid. However, a renowned taskmaster, Easterlow sets the bar high for his players and has the same lofty ambitions for himself. “At the end of my first season I felt proud of what we had achieved as a club, although we hadn’t won any silverware I was proud that the number of fans coming to games was up and that local talented footballers were playing for the club and everyone was talking about the club again. “I honestly feel that if I could have got my squad assembled how I wanted earlier last year and without the fixture pile-up at the end we could have sneaked promotion through that second spot but it was a step too far in the end. “We will learn lessons from last year, though, and be better for it I’m sure of that. “As much as I appreciate the fans and everyone’s kind words congratulating us at the end of last season with the club’s highest position for so many-odd years which resulted in the first FA Cup qualification since god knows when as well as us reaching the club’s first final for seven years. “All that’s a step in the right direction but I don’t think I would be a driven enough manager if I’m not disappointed to not win things. “We can’t forget what’s important. I wanted to win trophies for this club when I came here 12 months ago, that was my plan and it’s not changed. “It’s not easy for the lads playing for me, I demand a lot from them I know I do but I want mine and the club’s standards to be high. That’s how you’re successful.